← What Shall We Do Today? Can there possibly be a more endearing premise for a documentary than kids and a far-flung menagerie of animals starring in a true life scientific investigation? Invite a few academic luminaries along to drive the narrative and you get a story that must be told. “The pure joy of goofing around” as host David Suzuki intones during the opening sequence while a gorilla in a shallow pool spins around in absolute abandon. The Power of Play debuts on Canada’s most popular and beloved science series, CBC’s The Nature of Things later this week. The documentary examines one of the most compelling and richly layered activities of kids the world over – PLAY. But wait, it’s more than just kids having fun, more than homo sapiens and their primate cousins even. The filmmakers take a walk on the wild side trekking far beyond the somewhat predictably playful domestic dog and cat to check in on other species from the worlds of mammals, birds, fish, and reptiles. Be ready to get acquainted with the lighter side of turtles, rats, hamsters, elephants, an octopus and even a komodo dragon. A year and a half in the making, Nova Scotia’s Tell Tale Productions shot kids, animals and passionate advocates of kids’ play and animal behaviour in Norway, the US and Canada. What we see are kids being kids, animals being animals and the scholars speaking to why we should care about human and animal play, why this spontaneous and intrinsically motivated activity matters. There is something in our deeply rooted nature that is able to communicate with a whole range of life on this planet. The show is as entertaining as it is informative exploring little known aspects of animal behaviour. Who knew that fish play and I don’t mean some anthropomorphic Nemo-like gyrations. It took hours to capture a short segment showing a fish playing with a tin foil decorated ball at Dalhousie University’s Aquatron Laboratory. The investment of time is representative of the effort and patience required to understand how play displays in animals outside our relatively constrained domestic orbits. Behavioural ecologist, Johnathan Pruitt’s research leads him to conclude that, “things like play occur all over the animal kingdom.” I now admiringly think of Pruitt as Spider Man. His startling discoveries about public displays in the not so secret lives of – you guessed it, spiders – are expanding our understanding of play. And it’s not just any old spiders, his painstaking study is drawing back the veil so to speak on social spiders, a small subset of arachnids made up of a mere 20 species worldwide. Bonobos give play pride of place. It is a core component of their social interactions. Their adoption, or adaptation of play differentiates them from their close relatives the chimpanzees. A frequent chimp response on encountering other groups of their own species is to fight. Bonobos are more prone to make play, not war. Empathy brings the journey squarely into the camp of human experience. 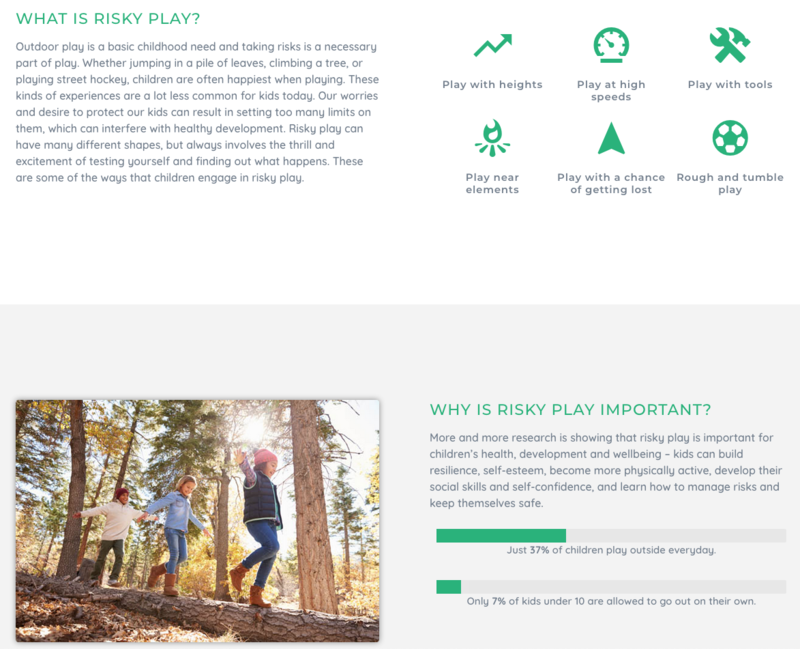 The program’s timing is spot on as caregivers, researchers, educators, healthcare and recreation professionals and journalists are examining attitudes and benefits associated with play, risk, resilience and independence. In the process there is a reset underway of some more recent cultural norms. Over the last two or three decades in North America and to a lesser extent Europe a pervasive adverseness to exposing kids to risk has supplanted independence, unsupervised play, and many aspects of outdoor kid culture that were thriving right through the 1970s. The preoccupation has been so pronounced in some quarters that in the UK for example the fixation has been tagged cotton wool culture, known too in other jurisdictions as bubble wrap kids. Informed by observation and evidence-based findings across a number of disciplines, there is a meaningful shift taking place related to risk. International collaborators Mariana Brussoni and Ellen Sandseter from Canada and Norway respectively are changing the way we perceive risk as it relates to kids at play. I came to the counter-intuitive conclusion that engaging in risk was actually a very important aspect of preventing injuries. Individually, each of the university-based researchers have devoted years of investigation to various facets of play. Brussoni recently launched outsideplay.ca “to help parents and caregivers gain the confidence to allow their kids to engage in more outdoor play.” Sandseter published seminal work for her doctoral degree – Scaryfunny: A Qualitative Study of Risky Play Among Preschool Children. Together they are being inspired by the children around them and are currently collaborating on remodeling playgrounds in eight Norwegian child care centres with the goal of making them more thrilling. Sandseter has it on good authority what it is that triggers those thrill factors. Through her interviews with children, she has developed a risky play inventory. They (the kids) usually say it tickles in my tummy. I get so happy and so excited that I just had to laugh out loud. The pre-school children in Trondheim, Norway embody the adventure, the boldness, the hope that we can take back play. There is a renaissance, a resurgence that will help counter some of the problems we are seeing linked to overuse of devices and screen time, to low self-esteem and more serious mental health issues in young people. As adults, parents and caregivers we have a responsibility to be play enablers in our communities. So how do we go about advocating for play? Tuning in to The Power of Play is a great first step. There is much more that I have not touched on here so choose a healthy snack, kick back, get comfy and play ‘watch a doc’ on Sunday, January 20 at 8 pm EST…. Let’s give the last word to Stuart Brown. A student of play for over 50 years he aptly sums it all up. What you find is that it’s necessary for a sense of optimism, fulfillment, for a sense of competency, for a sense of an authentic self. These are all components that play produces and many more for the well-being of individuals. Huge finding – girls play outside more when unsupervised. I can corroborate this here at home with our two girls, 11 and 9. PlayGroundology friends are you noting this too? Those who participated in the making of the film overwhelmingly felt that it was an honour, a significant opportunity to help present research to a broad audience that documents the far-reaching benefits of play. David Suzuki loves this show and and immediately saw the wisdom of the message about play. He was a real outdoorsy kid and encourages his kids and grandkids to do the same. He biked to the playground where he did the standup for this show. The film is being distributed internationally by SidewaysFilm. To date sales have been made to Sweden and Finland. The Power of Play‘s director, Christine McLean remembers being shooed outdoors with her siblings on cold winter days so her Mom could wash the kitchen floor. Mom wrapped them up warmly and gave them shovels and spoons to keep them busy in the snow. Looking back McLean sees those days of play as one of the best gifts their mom ever gave them. Where do your play memories take you? This entry was posted in CBC, Christine McLean, David Suzuki, Elisabetta Palagi, Ellen Sandseter, Erin Oakes, Gordon Burghardt, Johnathan Pruitt, Mariana Brussoni, Stuart Brown, Tell Tale Productions, The National Institute for Play, The Nature of Things, The Power of Play. Bookmark the permalink. Thanks, Alex, Suzuki is a great discovery here.